A NASA mission designed to explore the stars in search of planets outside of our solar system is a step closer to launch, now that its four cameras have been completed by researchers at MIT. 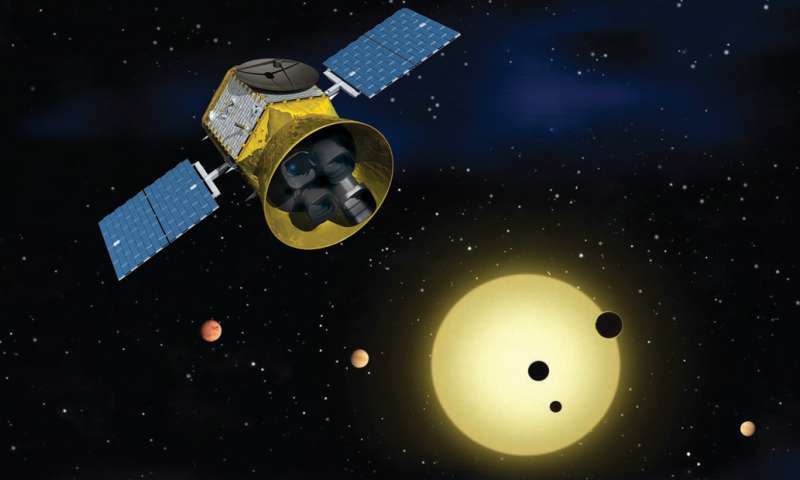 The Transiting Exoplanet Survey Satellite (TESS), due to launch in 2018, will travel through space, identifying more than 20,000 extrasolar planets. These will range from Earth-sized planets to much larger gas giants. TESS is expected to catalog a sample of around 500 Earth-sized and "super Earth" planets, or those with radii less than twice that of Earth. It will detect small rock-and-ice planets orbiting a diverse range of stars, including rocky worlds in the habitable zones of their host stars. "The scientific community is eagerly awaiting the launch of TESS and the first data release in 2018," says Sara Seager, the Class of 1941 Professor of Planetary Sciences at MIT and deputy lead of the TESS Science Office. During its two-year mission, TESS, which is being led by MIT and managed by NASA's Goddard Space Flight Center, will monitor the brightness of more than 200,000 stars. It will search for temporary drops in brightness caused by an exoplanet passing in front of its host star, as viewed from Earth. The satellite's four cameras, developed by researchers at MIT's Kavli Institute for Astrophysics and Space Research and the MIT Lincoln Laboratory, are equipped with large-aperture wide-angle lenses designed to survey the entire sky. Each camera consists of a lens assembly containing seven optical elements and a detector with four charge-coupled device (CCD) sensor chips. The overall process of designing, fabricating, and testing the cameras at MIT has taken four years to complete. 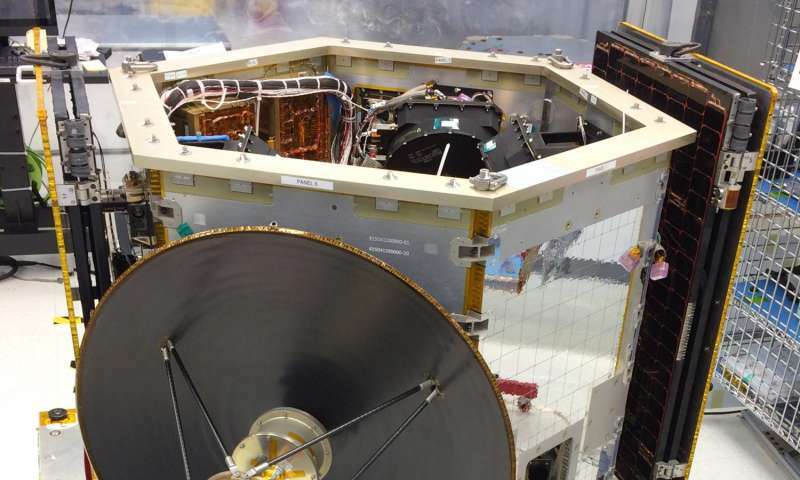 The cameras were recently delivered to Dulles, Virginia-based aerospace company Orbital ATK, where they will be integrated onto the satellite. The four cameras have been mounted onto the camera plate, and successful operation with the flight computer has been demonstrated. 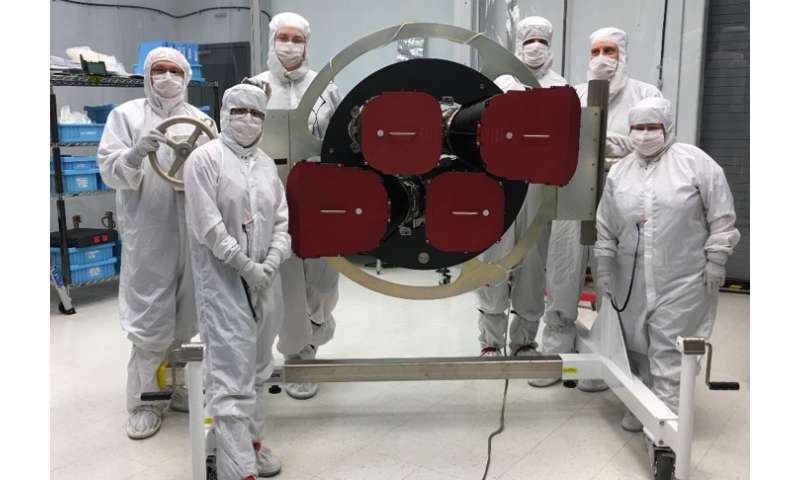 The instruments have just been inspected by NASA and a group of independent technical experts, as part of a formal Systems Integration Review of all TESS components, which they passed successfully. Each of the four cameras has a field of view that is more than five times greater than that of the camera flown on the earlier planet-hunting Kepler space observatory mission, according to TESS Principal Investigator George Ricker, senior research scientist at the MIT Kavli Institute. "The TESS four-camera ensemble instantaneously views a section of sky that is more than 20 times greater than that for the Kepler mission," Ricker says. "The instantaneous field of view of the TESS cameras, combined with their area and detector sensitivity, is unprecedented in a space mission." A complication found in very fast wide-angle lenses, such as those in the TESS cameras, is that the image sharpness varies over the field of view, and there is no single focus, as found in more conventional cameras. Furthermore, the imaging properties change as the temperature of the cameras changes. The MIT TESS team has subjected the cameras to extended, rigorous testing in conditions designed to replicate the environment they will be subjected to in space. These tests demonstrate that the cameras perform as expected, but with a small shift in focus relative to that predicted by models. This shift results in simulated stellar images in the center of the field appearing sharper than expected, while images at the edges of the field are somewhat less sharp. However, after independently studying the effects of this shift, researchers on the MIT TESS team and at NASA both concluded that the mission will readily achieve all of its scientific goals. TESS relies on its ability to sense minute changes in stellar brightness to detect planets passing across them. The data processing is designed to correct for the variations in image sharpness over the field for most of the stars, and it will produce a record of brightness over time for every star being monitored, according to Jacqueline Hewitt, director of the MIT Kavli Institute. The MIT TESS team will continue to carry out long-term ground tests on a spare flight camera to ensure that their in-orbit performance is well understood. Following its launch next year, TESS will divide the sky into 26 "stitched" sections and will point its cameras at each of these in turn for 27 days. It will explore the Southern Hemisphere in the first year of its mission, and the Northern Hemisphere in its second year. "TESS is classed by NASA as an Explorer mission with very focused scientific goals," Hewitt says. "It was designed to find exoplanets that are nearby and orbiting bright stars, so we can study them in great detail." The data produced by the cameras will first be processed by the spacecraft's on-board computer. They will then be transmitted to Earth every two weeks via the NASA Deep Space Network and immediately forwarded to the TESS Payload Operations Center at MIT. TESS is designed to identify nearby habitable zone planets for further characterization by other telescopes coming on-line, including the James Webb Space Telescope. The fact that there is a real chance TESS will be the probe that finds the first planet where life is identified outside the solar system gives me the proverbial goose bumps. Because this is so far removed from everyday life, it may be hard to appreciate just how profound this effort is. It is starting to get real. TESS look at all the stars within 300 light years of Earth. Been looking forward to it for years. Several good NASA videos on Youtube.